Can you feel tha funk! Be sure to listen to our live streaming music on The 70's Preservation Society called 70's Classics streamed at a vibrant 128 bitrate! 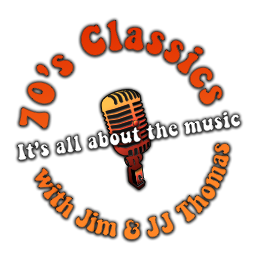 We offer 70's on Shuffle - A random mix of the whole decade! We also offer a live webcast with Jim and J.J. every Friday night at 8pm central time in the United States with The Class Reunion. You can request your favorite song or dedicate a certain song to a certain someone. Our On-Demand Content is for specials we may broadcast. You can also make a one-time or recurring donation to 70's Classics using PayPal by clicking on the donate button. For further details on donations, please see Donate Now button below.